JOIN VAE TO BUILD YOUR IDEAL COMMUNITY, OUT OF CARDBOARD! What if you were given the chance to design your own perfect city, totally from scratch? What would it look like? IMBY (In My Backyard) is a month-long collaborative experiment where everyone is invited to do just that - build their own version of the perfect city, right here at VAE Raleigh. The space will begin as a blank landscape that visitors are invited to build roads, public spaces, parks, infrastructure on top of. Visitors can use cardboard to create anything they would want to have in their real, perfect city. VAE’s staff will be on site to provide prompts to consider: food, culture, affordable housing, education, public utilities, accessibility, etc. IMBY is part interactive art installation, part game, and part community conversation. People of all ages and backgrounds are encouraged to come help build paradise. You are invited to build, renovate, tear down, or relocate buildings, green spaces, or entire sections of the city to fit your master plan. BUT beware this city is a meritocracy, so everyone has equal value and authority! Anyone else has the equal right to move things right back where they were or tear down your new building. VAE is providing the supplies and space simply to pose the question: What does an open source city look like? Help us shut down IMBY with a bang! Doors open at 7pm for an hour of beverages, dancing and last-minute IMBY building. 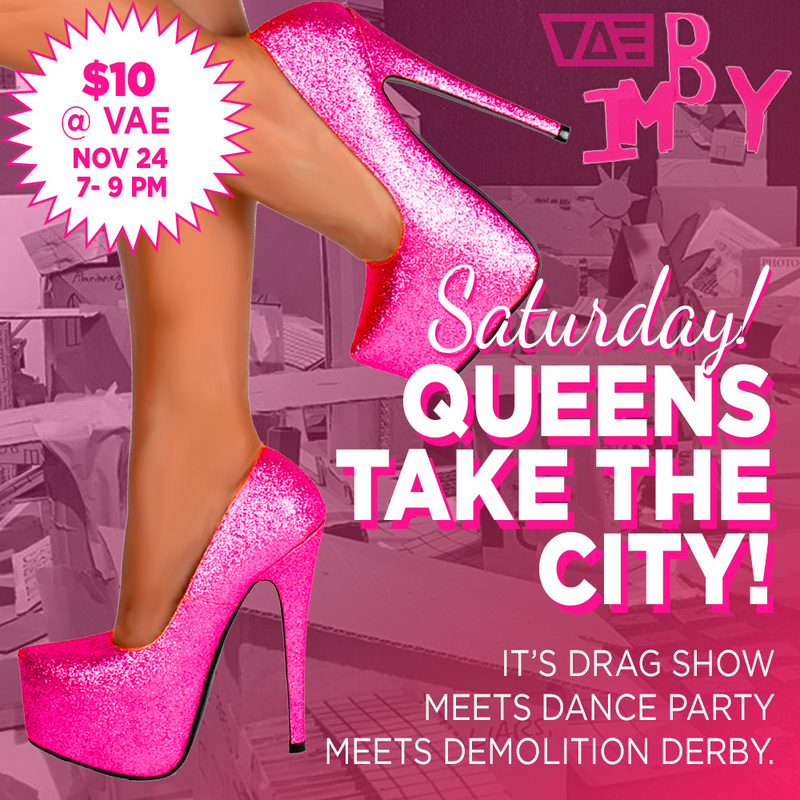 At 8, the destruction begins courtesy of the devastating beauty and wit of our hosting drag queens! Don’t miss this weird art exhibit meets drag show meets dance party meets demolition derby! FREE BUILD - is it exactly what it sounds like. Groups of any size can come in and build to their hearts content. No programming. Just cardboard. TOWN HALL: THE GAME - We have designed a building project game that pits roles and power structures against one another to see whose project comes out on top. Recommended for ages 10+ and groups of 6+. Allot an hour for optimal game play.